Chicken breasts are a go-to dinner choice in our family – they’re loaded with protein, low in fat, and cook up quickly. The one caveat is you have to jazz them up a bit or they can taste a little bland. Well there’s nothing bland about this recipe! 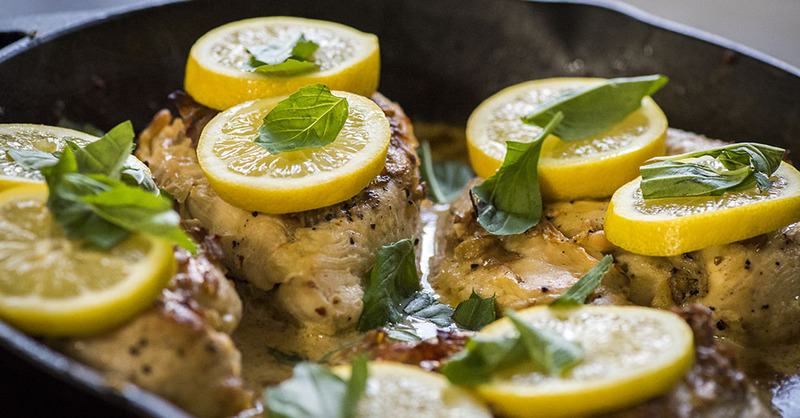 We created a bright and garlicky lemon cream sauce that is absolutely delectable. The best part is, after searing the chicken breasts, we made this sauce in the same skillet! Finish the whole dish off by popping it in the oven for a few minutes and you’ll have juicy and tender chicken with irresistible flavor! Preheat oven to 375º F and pound chicken breasts out to 1/2-inch thickness. Season both sides generously with salt and pepper. Heat olive oil in a large, oven-proof skillet and brown chicken breasts over medium-high heat for 2-3 minutes per side. Transfer chicken to a separate plate and sauté red onion in remaining juices until softened, 6-8 minutes. Season with salt and pepper. Add garlic and sauté for 1 minute, or until fragrant, then pour in chicken broth, lemon juice and red pepper flakes. Reduce heat to medium and cook, stirring occasionally, for 8-10 minutes, or until thickened. Make sure to scrape up browned bits from the bottom of skillet. Remove skillet from heat and whisk in heavy cream. Return to low heat and cook for 30 seconds, then remove from heat again. Return chicken to pan and cover it in sauce. Place skillet in oven and cook for 5-7 minutes, or until chicken is cooked through completely. Remove from oven and top with fresh basil and lemon. Serve warm and enjoy!